I hope that everyone is enjoying the 2012 Calgary Stampede! 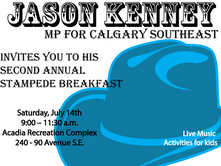 Calgary Southeast MP, Jason Kenney will be hosting his second annual Stampede Breakfast on Saturday, July 14! This event was a huge success last year and it was a lot of fun for all who attended. I will be volunteering at this event so be sure to say hello if you stop by!